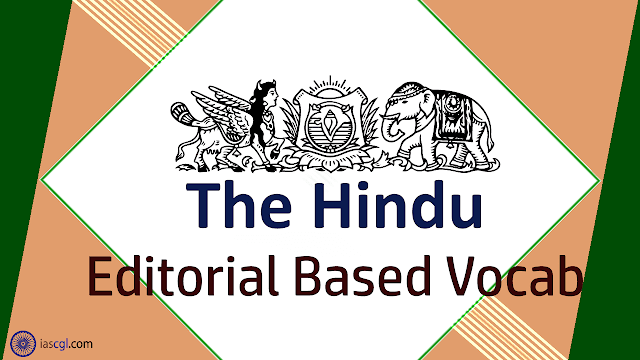 HomeVocabThe Hindu Vocab 26th September 2018 For Competitive Exams. The Hindu Vocab 26th September 2018 For Competitive Exams. Vocabulary from The Hindu Editorial 26th September 2018 for Staff Selection Commission(SSC) Combined Graduate Level, Combined Higher Secondary Level, Bank PO, Clerk and other state Government Examination. The process of filing claims and objections by persons left out of the draft National Register of Citizens in Assam began on Tuesday, in an atmosphere fraught with uncertainty about the documentation needed and possible recourse for those who may ultimately not clear the final list. In the draft published on July 30, as many as 40 lakh of the 3.29 crore applicants found their names missing. It is vitalat the state do all it can to create an enabling environment to assist people grappling with paperwork and bureaucracy to assert their claim to being legitimate citizens of India. It is equally important that the government, in Assam and at the Centre, think the future through humanely and practically in regard to those who may remain off the final list. These persons will have many levels of appeal as next resort — but India needs to officially give the assurance that it will not condemn undocumented immigrants, who lack wherewithal and are the most unfortunate victims of poverty and South Asia’s complicated history, to their own devices. This empathy is in keeping with India’s tradition of giving refuge to those who have nowhere to go. It is disturbing that instead, even as the finalisation of the NRC is on, the register is becoming a pretext for political outreach based on xenophobia and demographic messaging. Leaders of the Bharatiya Janata Party, which is also in power in Assam, are freely recommending NRCs across India, and using the process in Assam to create new fault lines. This weekend, at a public meeting in Delhi, the BJP president, Amit Shah, rallied the crowd by referring to infiltrators allegedly in the country, claiming they were eating away at India’s future. The comparison he made for this eating away from within was with “deemak” (Hindi for termites). Mr. Shah has, of late, dwelt many times on the need to identify illegal immigrants in the country, whose numbers he says are in crores. This has already drawn a response from Bangladesh, with Minister of Information Hasanul Haq Inu calling Mr. Shah’s comments “unwanted”, and also reiterating Bangladesh’s position that the NRC exercise is India’s internal matter. Mr. Inu has also referred to Delhi’s own communication, including from Union Home Minister Rajnath Singh, that the NRC process is India’s internal issue. Beyond the data and diplomacy angles, there must be concern about the language being employed. Analogies to pests that attack a society from within are the staple of dangerous polarising rhetoric. The use of the NRC in electoral rhetoric is even more dangerous. Regrettably, the BJP seems determined to proceed with such mobilisation, knowing full well the damage it will cause to Indian society. Fraught: भरा हुआ - (of a situation or course of action) filled with or destined to result in (something undesirable). Vital: महत्वपूर्ण - absolutely necessary or important; essential. Grappling: जूझ - engage in a close fight or struggle without weapons; wrestle. Assert:जोर- state a fact or belief confidently and forcefully. Condemn: निंदा करना- express complete disapproval of, typically in public; censure. Wherewithal: किस उपाय -the money or other means needed for a particular purpose. Empathy: सहानुभूति - the ability to understand and share the feelings of another. Xenophobia: विदेशी लोगों को न पसन्द करना- intense or irrational dislike or fear of people from other countries. Demographic: जनसांख्यिकीय - relating to the structure of populations. Polarising: ध्रुवीकरण - restrict the vibrations of (a transverse wave, especially light) wholly or partially to one direction.